Thank You Notes for Wedding Gifts: Wording a message to convey thanks for a wedding present? Take ideas from this post to create a sweet quote that is the perfect fit for friends, family or colleagues. Etiquette suggests that a formal note of thanks should ideally be on a small greeting card or by email. Informal expressions of gratitude to friends can be on Facebook, Pinterest, Twitter or even by text. So spare a moment to say Thank You to everyone for attending your wedding and blessing you with their wishes and gifts. It doesn’t matter whether a gift has a cheap or an expensive price tag – the value of a gift is measured by feelings and emotions. Appreciate their gifting sense… so that they can bloat away with pride and remember to get amazing gifts for you every single time. 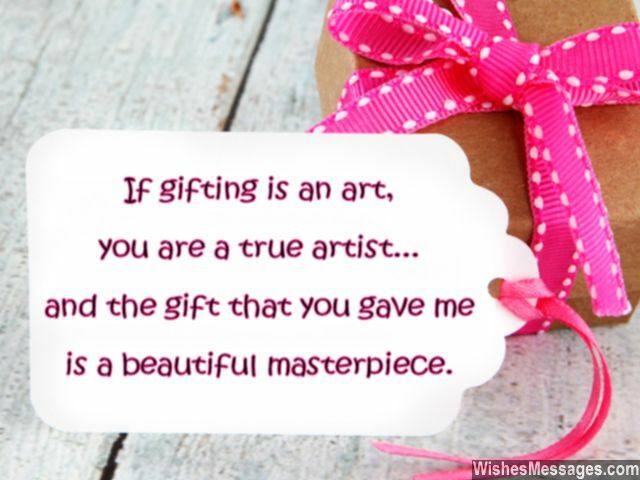 1) If gifting is an art, you are a true artist…. and the gift you gave me is a beautiful masterpiece. Thanks. 2) I have always been flaunting you off as the best friend I could ever have. Now I will also flaunt your wedding gift as the best gift I could ever get. Thanks. 3) Pinterest might crash if I upload a picture of the beautiful gift that you gave me. Thanks. 4) The wedding might be over but for us, the party continues because we’re opening your lovely gifts! Thanks. 5) Christmas, Thanksgiving, Birthdays or Weddings… I officially hire you as my gifting consultant. Thanks for such an awesome present. 6) Your beautiful smile added happiness to our wedding photos and your beautiful gift added happiness to our married lives. Thanks for such a beautiful present. 7) Bridal registries would never exist, if all friends and family members were as considerate and thoughtful like you. Thanks for a lovely wedding gift. 8) We got the wedding we always wanted, graced by the friends we always hoped would come and received the gifts we always wished for. Thanks for making all our dreams come true on our wedding day. 9) Thoughtful is a skill and Generous is a quality that you should add on your LinkedIn page. Thanks for such a lovely gift. 10) Even Google couldn’t have searched for a better gift for me. Thanks! 11) I consider myself extremely wealthy… because I have friends who give me the most luxurious of gifts. Thanks. 12) I stopped worrying about my wedding registry because I have good friends like you – who read my mind and always give me more than what I asked for. Thanks. 13) Your wedding gift was fantastic and something that I have always wanted – just like how you have been a fantastic friend to me all my life. Thanks. 14) Your wedding gift is not precious to me, only because of its big price tag. It is precious also because it has been given by a person whose presence in my life is priceless. Thanks. 15) On our wedding day, we thought that life couldn’t get any better – until we started opening all your presents. Thank you everyone for giving us such wonderful gifts. 16) Our wedding celebration lasted just for a day, but your gift will be a lifelong reminder of how it was graced by lovely friends like you. 17) You should have been a clairvoyant because you read my mind and gave us exactly what we wanted. Thanks for your gift. 18) If your wedding gift was a Facebook page, it would get millions of likes, hundreds and thousands of shares and an endless list of fans. Thanks for such an awesome gift. 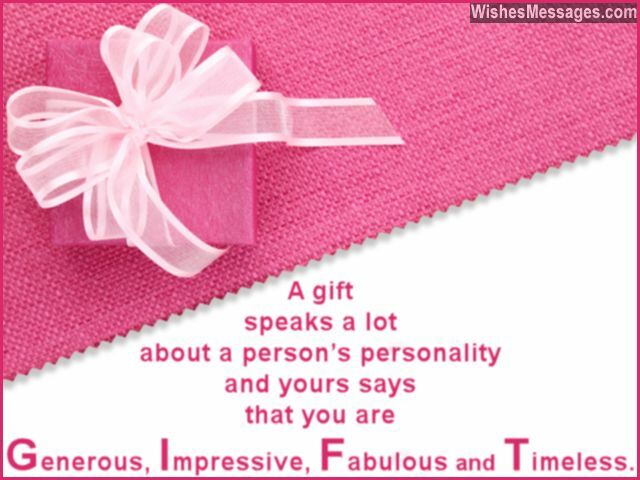 19) Irrespective of the price tag, your gift is worth a million dollars. Thank you so much. 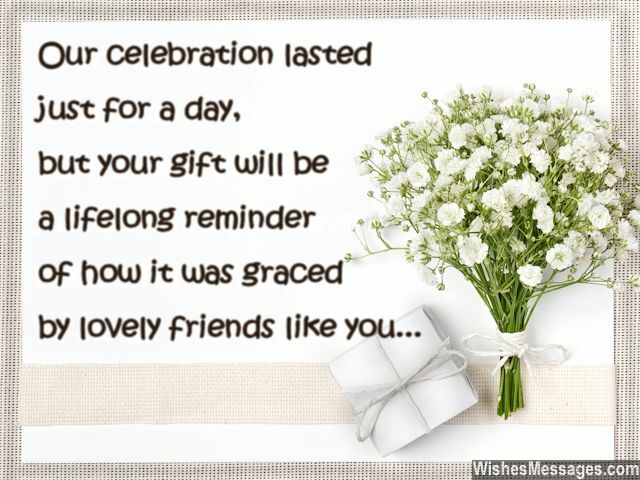 20) Money can buy garish luxury but it can’t buy the elegant thoughtfulness that you put into your gift. Thanks a lot. 21) The wedding present you gave me is not just going to be a permanent fixture in my home, but also a permanent fixture in my heart. I loved it, thank you. 22) Whenever I look at your gift lying in the living room, I will always be reminded of the beautiful memories of my wedding. Thanks for giving me such a thoughtful gift. 23) Thanks for your wedding gift. I am going to send my husband to you for a short lesson on the Art of Gifting. Please train him well. 24) Thanks for writing us a generous check as a wedding gift. It will be a contribution towards our dream to have our own home in which you will be among the first guests we will call over for dinner. Thank you so much. 25) Your wedding gift is just like your presence in my life – irreplaceable. Thanks. 26) Who needs bucket lists, wish lists and gift registries when you have cool friend who give you the coolest stuff ever? Thanks for such a cool wedding gift. 27) Even if I send you thank you notes every single day to tell you how much I have liked your gift, it won’t be enough to express my gratitude. Thanks. 28) Do you know what the problem with your gift is? It is so beautiful that it makes all the other gifts look dull and uninteresting. Thanks. 29) Your wedding gift confirms what I always believed about you all these years – that you are the most creative person in the whole world. Thanks for your beautiful gift. 30) I expected nothing less than a smart, practical and intelligent gift from a smart, practical and intelligent guy like you. Thanks for living up to my expectations. 31) A GIFT speaks a lot about a person’s personality and yours says that you are Generous, Impressive, Fabulous and Timeless. 32) Have you considered a career change? After looking at the gift that you gave us, I am certain that you have the potential to become the country’s best Gifting Consultant. Thank you so much. 33) The richest people in the world may be able to afford ANYTHING IN THE WORLD. But only I have the luxury of having friends who give gifts that MEAN THE WORLD TO ME. 34) You wedding gift may not have cost you a million dollars but it is so special that we wouldn’t sell it even if someone offered us a million dollars. Thanks. 35) Do you know what cheap, frugal, inexpensive and thrifty have in common? All these words are exactly opposite of how I would describe the wedding gift that you gave to us. Thanks.